This time, from Wolfville to Kentville, I am literally going just up the road. Today is the last day of the tour! I’ve had great conversations about publishing— conversations that go far beyond what I could ever blog about—once, twice, sometimes three times a day for a full month now. I’m exhausted, but in the way I imagine one would be at the end of a marathon. I suppose in a way this has been a marathon. 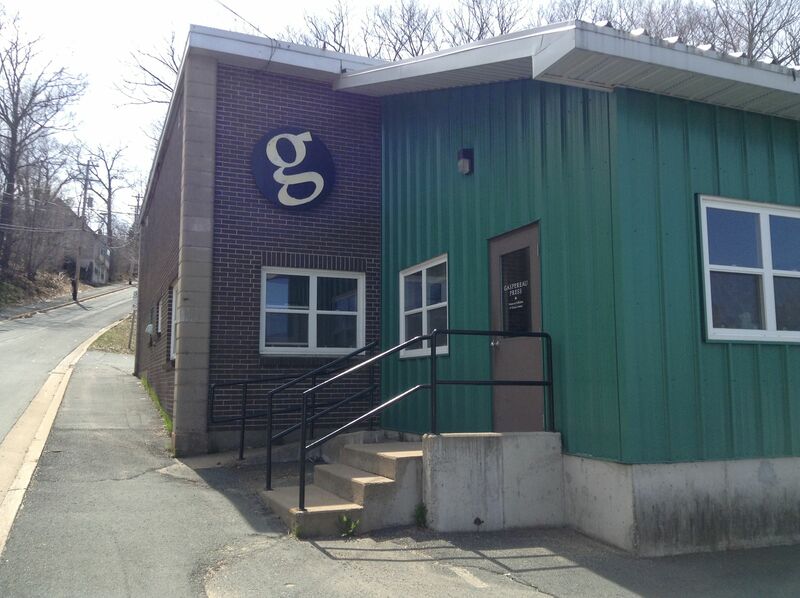 Gaspereau Press from the outside. Walking into Gaspereau Press headquarters, I’m alone at reception for only a brief while before Andrew Steeves, co-founder and publisher, comes around the corner to greet me. He brings me into the shop where he’s helping his intern Charlotte prepare to print the covers of her own chapbook on a hand-cranked letterpress. 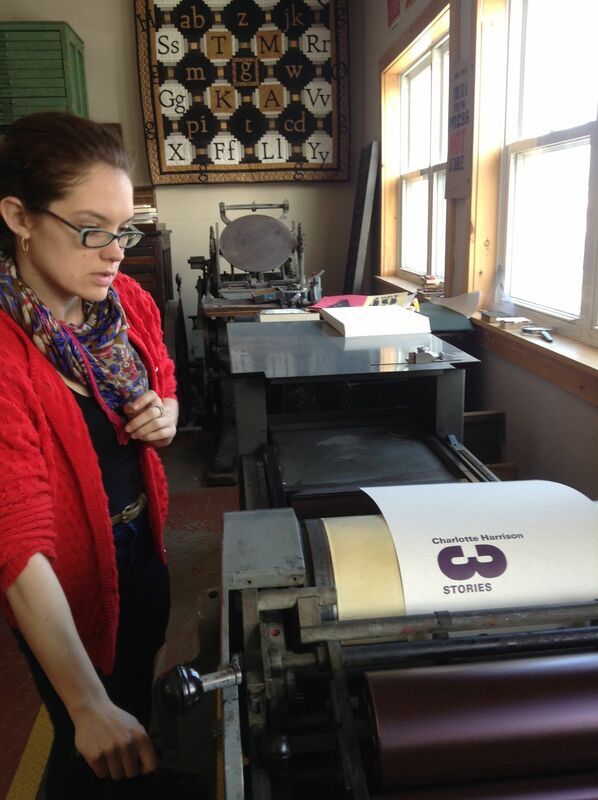 Charlotte prints a cover for her own chapbook! It’s a cluttered space, but it’s charming. There are stacks and stacks of trays of type. A giant wood table in the centre of the room acts as a multipurpose workspace. I imagine this is how print shops typically looked in the early 1900s, too. Being amidst the equipment—and the smell of paper and ink—makes me feel more connected to publishing’s history. 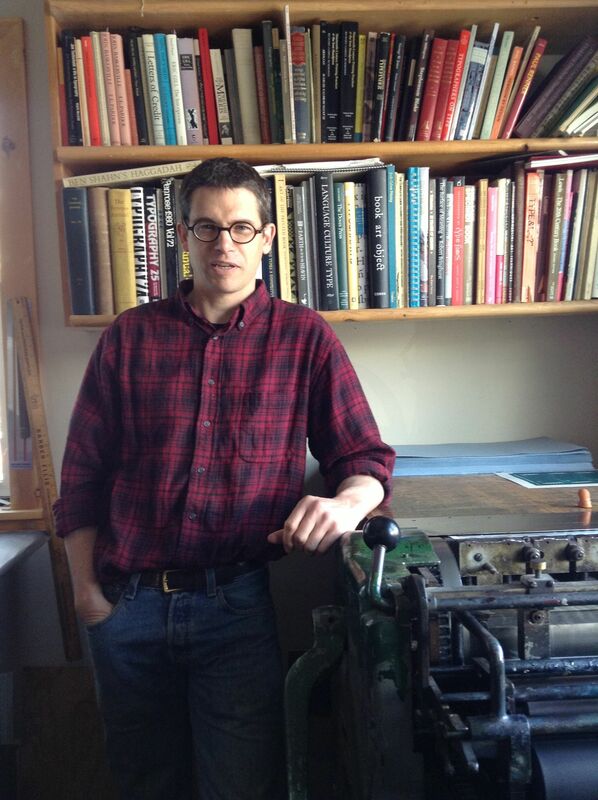 As we walk through the press, I get to see everything in process and at work, from covers stamped with a handmade block carving, to the sewing machine that binds all of Gaspereau’s books (which Gary Dunfield, Andrew’s business partner, graciously turns on just for me). I expected equipment like this to be a large expense to the press. Surely something with such history is bound to cost some serious cash. In fact, the machines are priceless. Sometimes literally priceless…as in they were free. A Vandercook he spotted under some old boxes when he was at a shop in Halifax. Another machine he paid $20.00 for when he stumbled upon it in Moose Jaw, SK. After spending a few hours in and around the shop, and going for lunch at a pub down the street, Andrew has a surprise for me and Charlotte. The three of us pile into the cab of his pickup and drive back to Wolfville to visit Acadia University. With Rock-Star access, he’s able to get us into the archives and has a number of different books pulled for us, including some of the oldest books ever printed in Canada. 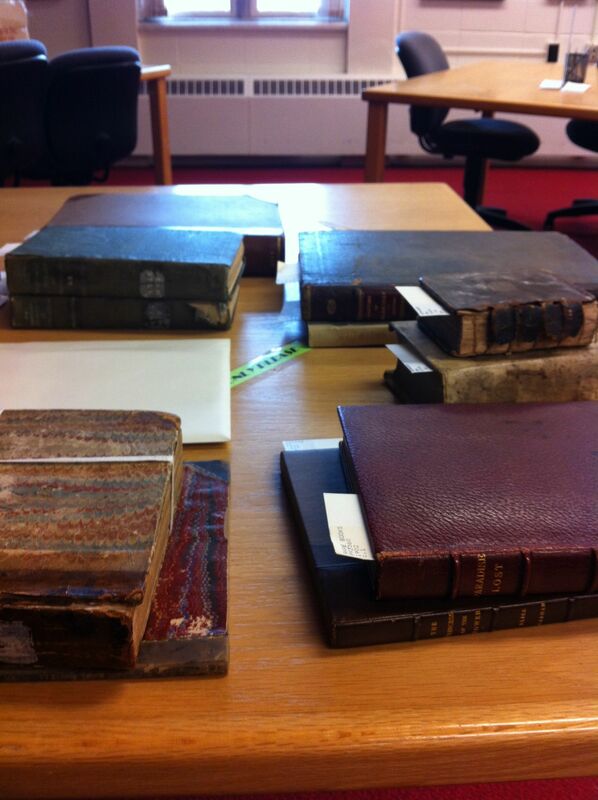 The selection of books Andrew had pulled from the archives at Acadia University. 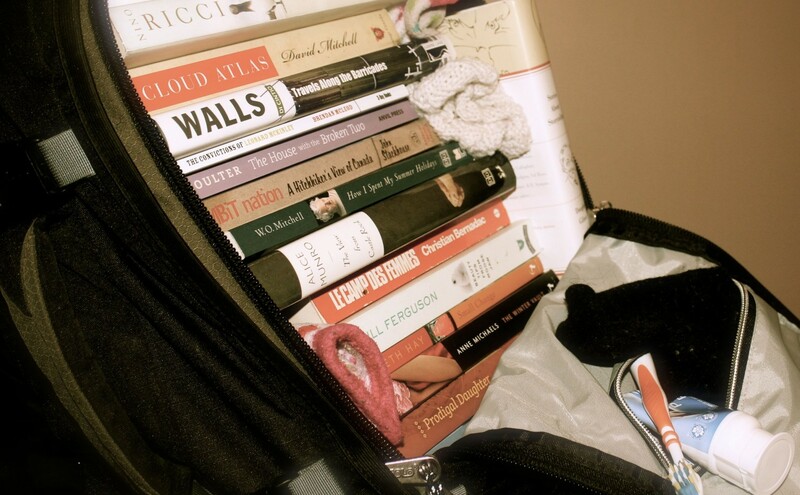 Across the country I have met many people who see a book not for just the story it contains, but as a physical object—for the esthetic of the cover, the paper, the binding, the font. Until Andrew, I have never met anyone who feels more passionately about the esthetic of each single letter of a typeface. While most word-people are able to tell you their favourite fonts, and many can distinguish between a serif and a sans-serif, how many do you know that pay attention to things like how the line on an e slants? Andrew’s knowledge of publishing history and type is astounding, and while I knew I wouldn’t be able to absorb everything he had to say (because it was a lot! ), I felt privileged to be sitting with him and observing him completely enraptured by his passion. The day is hardly over. After a not-so-quick stop at one of his favourite used bookstores in Wolfville, we head back to Kentville to grab a coffee and some wine for the evening. From there, I follow him in my rental and we take curvy, unmarked roads to his home outside of Kentville. Pulling up to his property, I hesitate. I’m worried that I might accidentally run over one of the many chickens running loose in the yard. Andrew built this home himself, and it runs completely off-the-grid. Inside, his home is much like his shop in that it is a blend of old and new technologies. Cell phones instead of landlines, but a woodstove instead of a furnace. The rest of the evening happens in a blur. I get the chance to meet his wife and sons (his daughter’s out for the night). I get to pet his dogs and cat. One of his authors stops by, too, and while there is much talk of books, there is also talk of each others’ non-book lives. Before coming out to Kentville, Andrew told me he would shuffle some kids around to make space for me to spend the night, but as I’m brought to the room somewhere around midnight, it’s definitely not a kid’s room. I don’t ask, but I’m sure that Andrew and his wife gave up their room for me tonight. Classic east coast hospitality and the epitome of what the trip has been across the whole country: People open to meeting a stranger and letting her peek into their work and lives. I go to sleep thinking nothing but gratitude.